Yes I have been meeting a lot of nice people lately, people who cook good food, talk about old fashioned real food and serve lovingly prepared delicious food. Last couple of weeks were like that and it feels very comforting that I can recount those moments by putting my experience into words here. Getting reminded of good food enjoyed in good company comes as a relief trust me, especially when you have been swamped with work that starts feeling overwhelming sometimes. Sometimes I quickly recreate a recipe that I ate and feel even more pleased with myself. 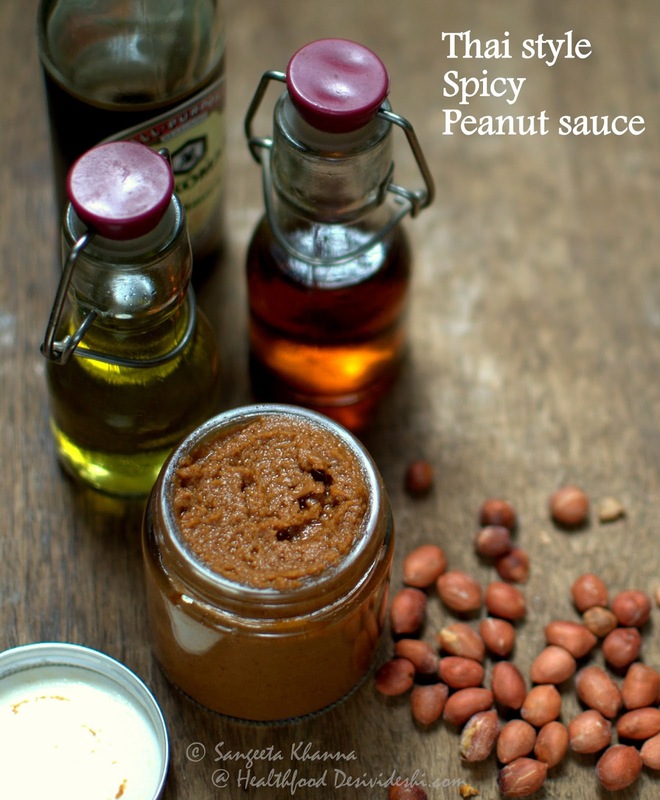 This Thai peanut sauce was one such recipe I whipped up in just about a couple of minutes. Blend everything together till creamy and smooth. Store in a sterile glass jar for a week or at room temperature. Serve with appetisers or dilute with more olive oil and vinegar to use as salad dressing. Now let me tell you how I was reminded of this Thai peanut sauce. 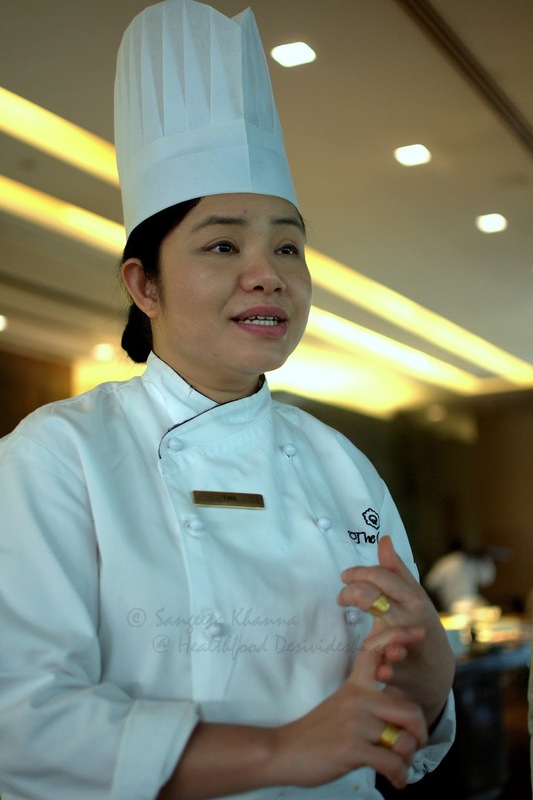 Last week we had the pleasure of enjoying Thai food cooked by Chef Tam who has come from The Oberoi Bengaluru's Rim Naam Thai restaurant and is serving her signature dishes at Threesixty degrees restaurant, at The Oberoi Delhi. She is here till 31st Oct but the good thing is that her signature dishes will be included on the regular menu too. Her favourite ingredients are fish sauce, lemongrass and palm sugar and interestingly the first thing she asked me if I like spicy food and of course if I have some allergies. Spicy in Thai food means Thai bird chillies and I experienced that she balances these really well in her food. I am always happy to announce I have no reservations regarding food and I can eat everything, too hot or too bland foods come with their own pleasures and I am open to it. I am always rewarded with good experiences I must add. If we consider traditional food, every bland traditional recipe has evolved for a reason and every extra hot recipe also has a reason in the bigger scheme of a particular cuisine. We just have to take care of planning the meal to keep it balanced. And what a balanced meal we were served by the Chef, both in terms of flavours and nourishment. She had already selected the menu for us and we just followed suit. Among the appetisers we were served Chicken Satay (Satay Kai) with Thai peanut sauce. While chicken satay was good the Thai peanut sauce that came with it was addictive. The Som tum was extra hot as warned beforehand, we just loved it. I make this salad at home and wondered why I don't make it this hot. I took a second helping in fact, mentally noting down to make extra hot Som tum next time I do. The Pandan wrapped chicken (Kai hor Bai toey) was very flavourful, juicy and tender. This is something you shouldn't miss when you go to Threesixty degree. The deep fried Prawn cakes were good too, just like any deep fried appetiser. The Thai green curry (Kaeng kiew wan) was comforting and homely. I mean the use of fresh ingredients when I say homely here, it is easier for me as I grow these herbs and have been cooking Thai green and red curries for decades now. I wish I had discovered this stir fried rice with Tom yam paste (Khao phad tom yam) too. It came wrapped in a cone of banana leaf and blew my mind away. Phad Thai came loaded with chicken, prawns and loads of sprouts too and became one of the best I have tasted till now. 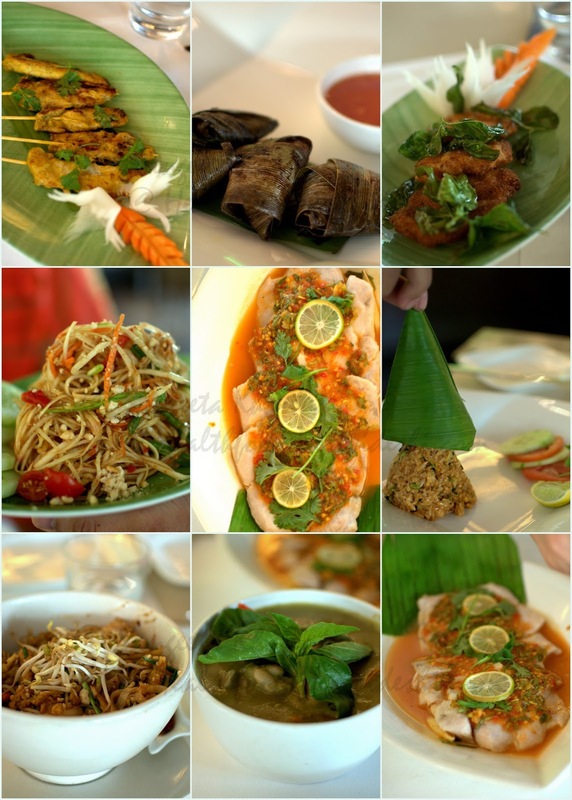 The steamed fish (Pla Neung Prik Manao) is a Rim Naam signature fish and we loved it too. It had good amount of chilli heat as we had nodded for high heat levels when Chef had asked, but the Thai herbs were not masked by the chilli. Fresh lemongrass, bird chilli, galangal, turmeric and coriander greens making the fish what it was, with a lemony zest. Chef served the dessert herself, mixing it gently and explaining. 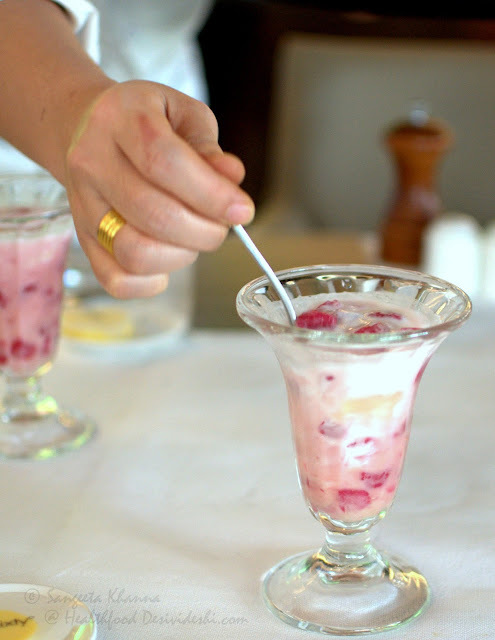 This jellied water chestnuts in coconut milk (Tab Tim Krob) is a favourite already, this one came with Lychee halves making it more rich textured and flavourful. A little too sweet for my taste but so good that I actually finished it. I rarely finish my desserts and don't take second bites if the dessert is too sweet normally. And I asked some tips from Chef to make Tab Tim Krob with natural colour (using beets) as I have failed in doing so earlier. She sweetly told me how to do it and I came back happy.